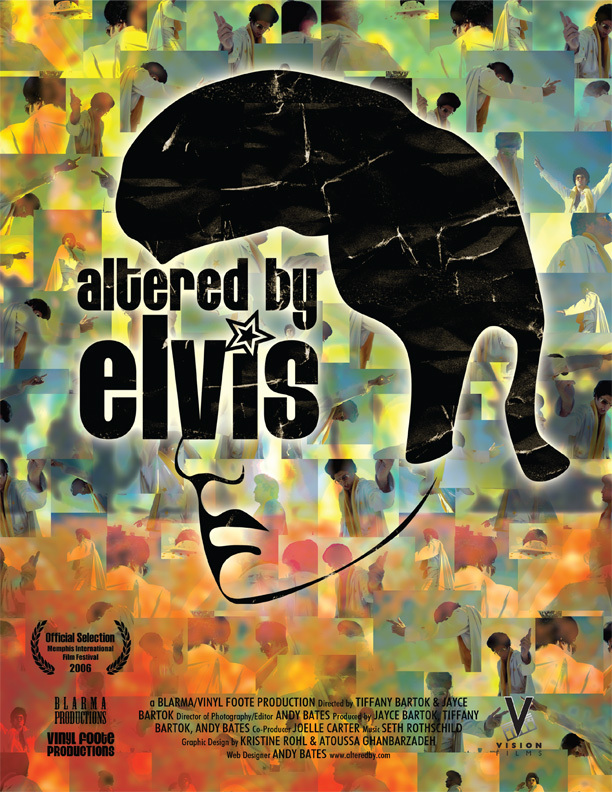 ALTERED BY ELVIS, a 54 minute documentary shot on location across the U.S., is a moving, and often hilarious, exploration of lives fathered, fulfilled, and even destroyed by the King of rock and roll. From extreme fans to loyal loved ones to those who make their living off the King, ALTERED BY ELVIS digs deep to expose the stories of those he left behind. Listen to Larry Geller recount styling Elvis' hair for the star's heartbreaking funeral, Vicki Fritz explain why she moved from Milwaukee to Memphis to be near the King's grave, and Jimmy Denson reveal his explosive reasons for hating Elvis more than any man alive! The camera doesn't flinch as it captures rich stories from Dixie Locke Eammons (Elvis' first girlfriend), Alfred Wertheimer (famed Elvis photo journalist), and StingRay (NYC's #1 tribute artist). 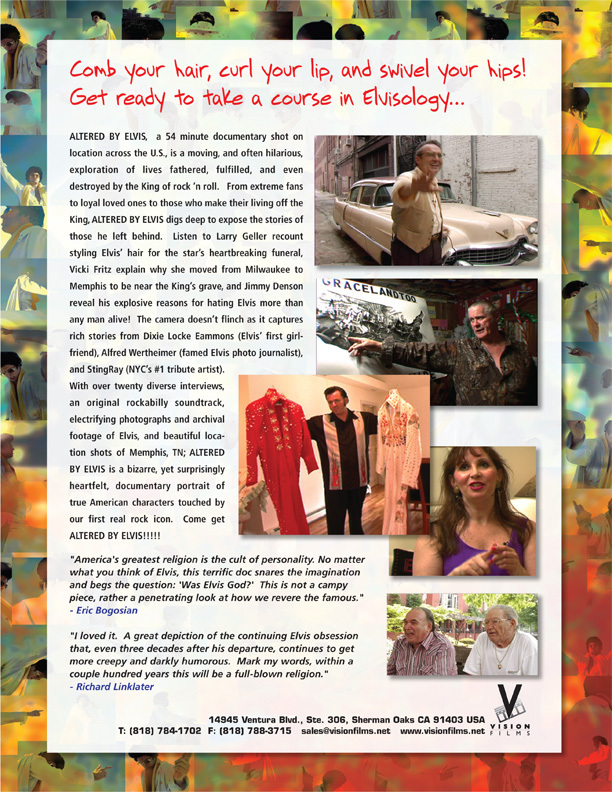 With over twenty diverse interviews, an original rockabilly soundtrack, electrifying photographs and archival footage of Elvis, and beautiful location shots of Memphis, TN; ALTERED BY ELVIS is a bizarre, yet surprisingly heartfelt, documentary portrait of true American characters touched by our first real rock icon. Come get ALTERED BY ELVIS!!!!! "I loved it. A great depiction of the continuing Elvis obsession that, even three decades after his departure, continues to get more creepy and darkly humorous. Mark my words, within a couple hundred years this will be a full-blown religion." "America's greatest religion is the cult of personality. No matter what you think of Elvis, this terrific doc snares the imagination and begs the question: "Was Elvis God?" This is not a campy piece, rather a penetrating look at how we revere the famous."